+226 pages with frontispiece and diagrams. Octavo (8 3/4" x 6") issued in blue cloth with gilt lettering to spine and cover and black embossed decoration to cover. (Betts: 15-6) First edition. 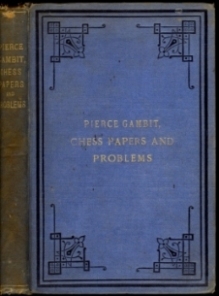 Contains an analysis, with illustrative games, of the variation commencing 5. 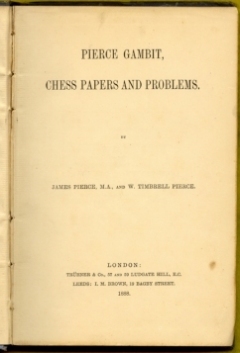 P-Q4 (d4) in the Kings Gambit, by W T Pierce; "Chess Papers", a collection of miscellaneous articles and poems, by J Pierce; and 134 problems by both authors, including 42 two-movers, 65 three-movers, and 27 longer problems, with solutions at the end (a few self-mates are included). Corners bumped, spine ends and corners rubbed, spine head chipped, soiled, spine age darkened else a good to very good copy issued without jacket.